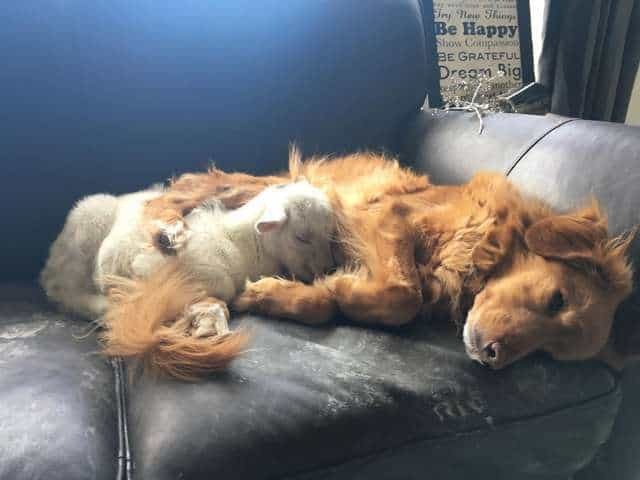 If you needed any more proof that animals are too pure for words, then look no further. 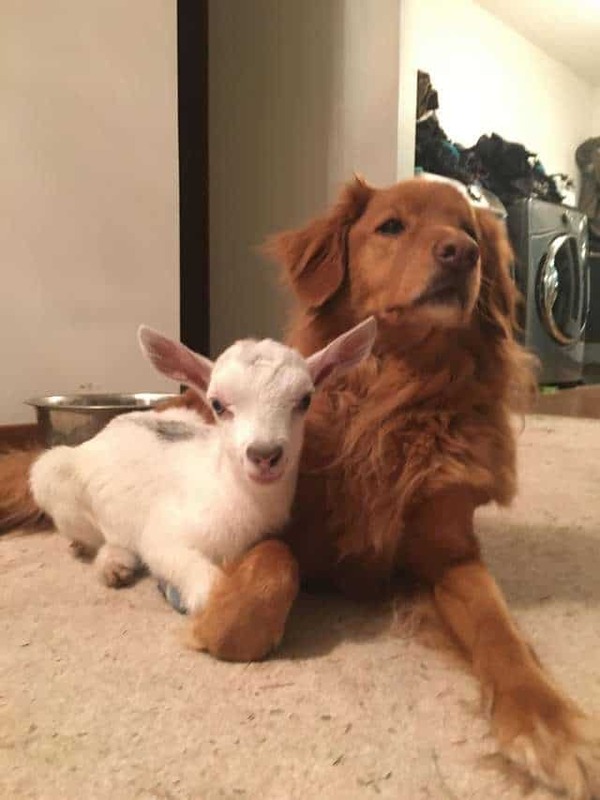 Watching this dog and goat cuddle on the couch restores your faith in everything good in the world. 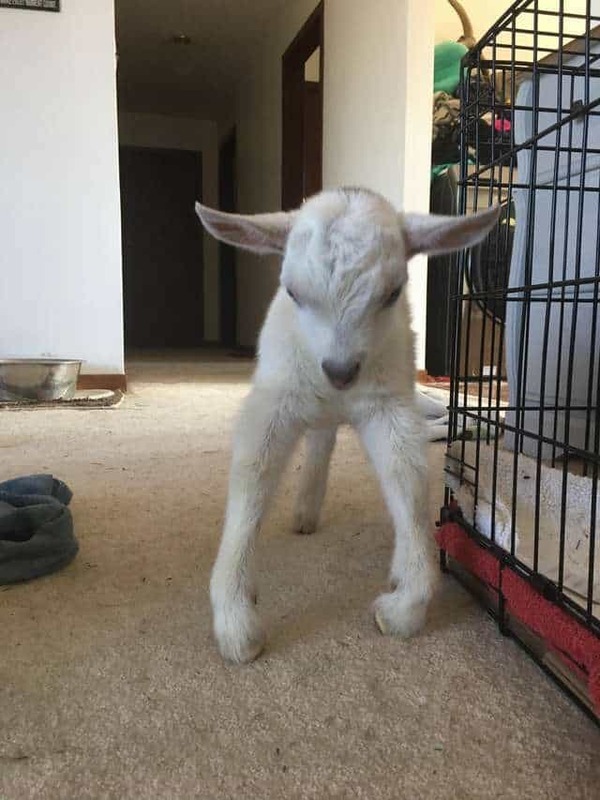 Arnold the baby goat was unwanted as soon as he came into this world. 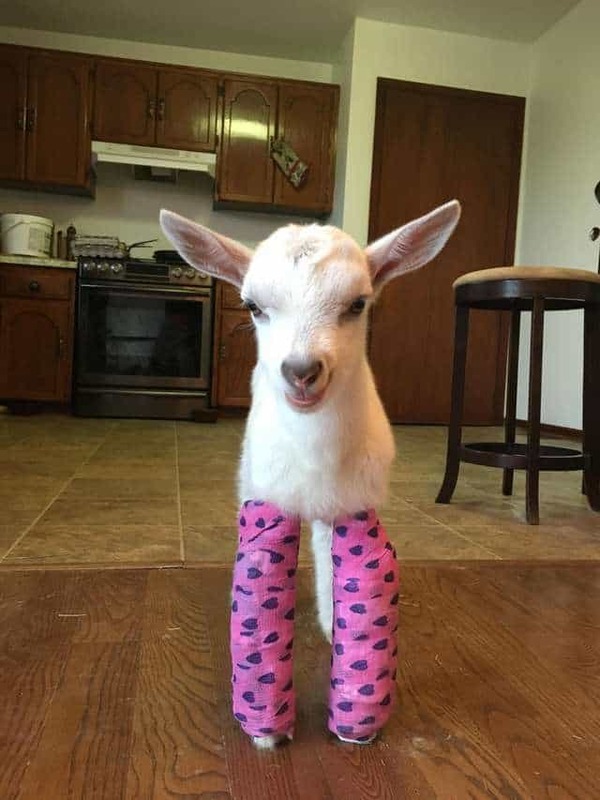 Tiny Arnold was born with crooked legs, so nobody wanted to deal with him. Arnold was going to be put down at just a couple of days old. Thankfully, the Black Goat Farm And Sanctuary rescued him and brought him to their sanctuary. Immediately, he began physical therapy to help strengthen the tendons in his legs. He even got little splints for his legs. Despite his difficulties, Arnold still managed to find the strength to enjoy life and make friends. One, in particular, being a retriever called Drake. Arnold fell in love with Drake and they have become the snuggliest buddies. 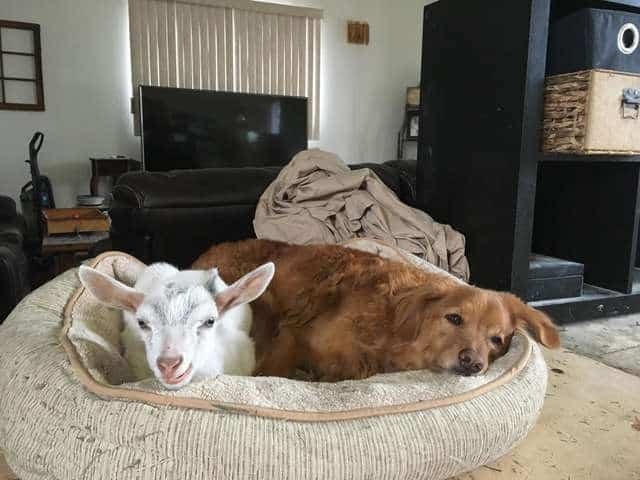 Drake loves lying around on the couch, and Arnold discovered that there was nowhere else he would rather be either. 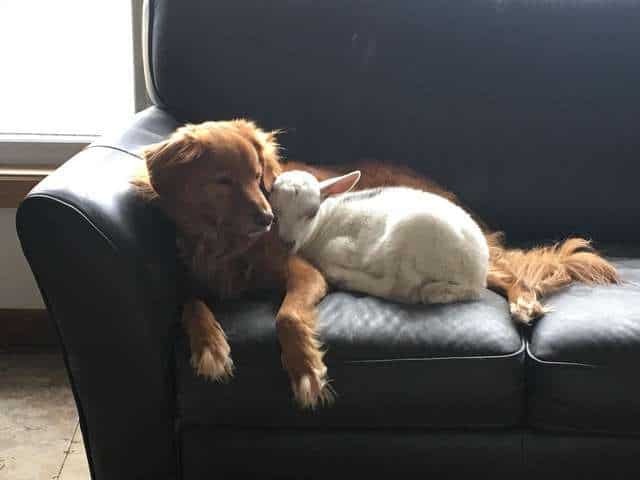 Because of the discomfort his legs can cause him, Arnold loves nothing more than relaxing on the couch with his best buddy. Their mutual love for lazing about has evolved from side-by-side lazing to full on spooning. 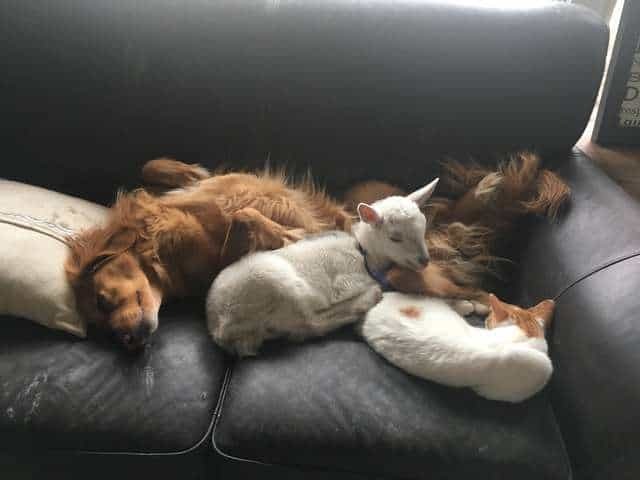 It looks like the pair has such a great time cuddling that other animals want to get in on it too. These two slobs spent more time cuddling on the couch than I’ve ever seen. 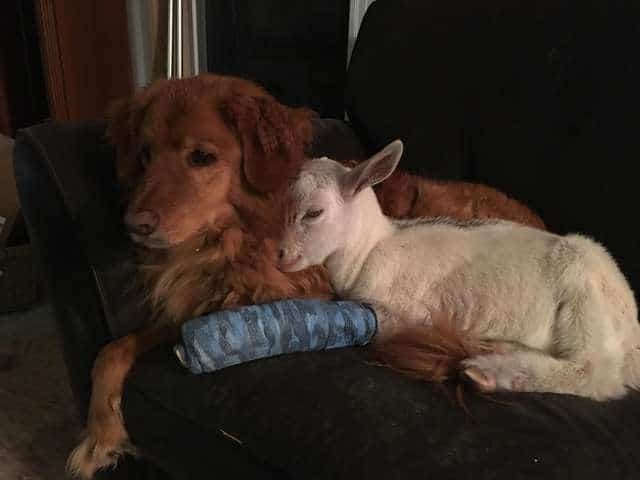 Thanks to the help of the sanctuary and the love of his favorite cuddle buddy, Drake, Arnold’s legs began to heal. 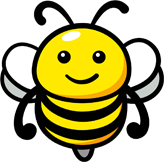 He started growing bigger and stronger and he was able to become more active. Arnold is getting bigger now, so his time as ‘little spoon’ may be running out. But one thing is for sure, their cuddling days are far from over. Recently, Arnold had a growth spurt that aggravated a tendon in his leg and so he had to have a new splint fitted. But he knew exactly what he needed to do to feel better. 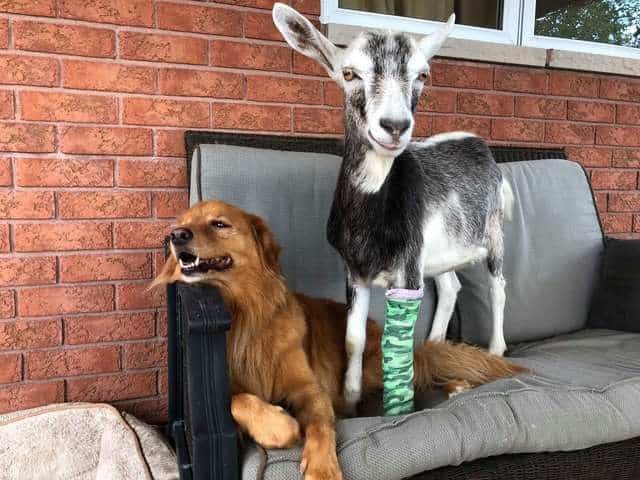 He came to the house, he hopped right up on the outdoor couch with Drake to snuggle. 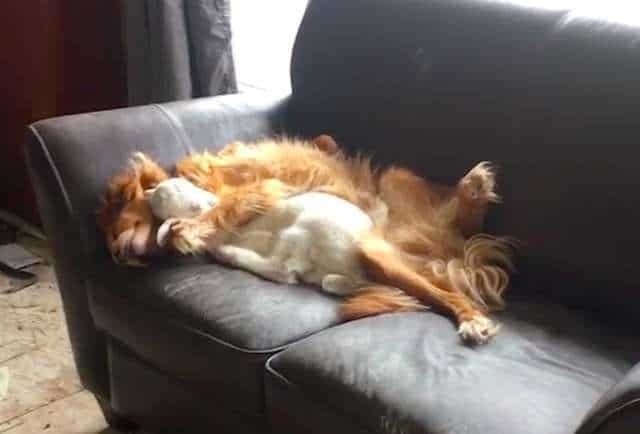 It looks like there is no stopping these adorable cuddle buddies, no matter how big they get.